Many industries, both inside and outside of technology, are versed in the terminology ‘cheap and cheerful’. When enthusiasts were overclocking their CPUs at the turn of the century, this was the case – taking a low cost part, such as the Celeron 300A, and adjusting one or two settings to make it run as fast as a Pentium III 450 MHz. This gave a +50% frequency boost at the lower price point, as long as one could manage the heat output. 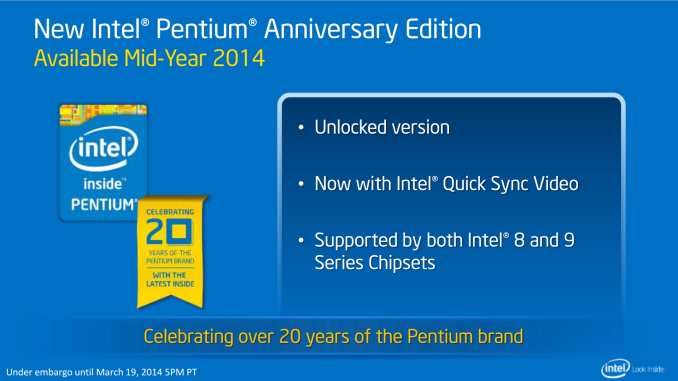 The Pentium Anniversary Edition is a small nod back to those days, and to celebrate the 20+ years of Pentium branding, Intel is now releasing a $75 overclockable dual core Haswell-derived CPU. 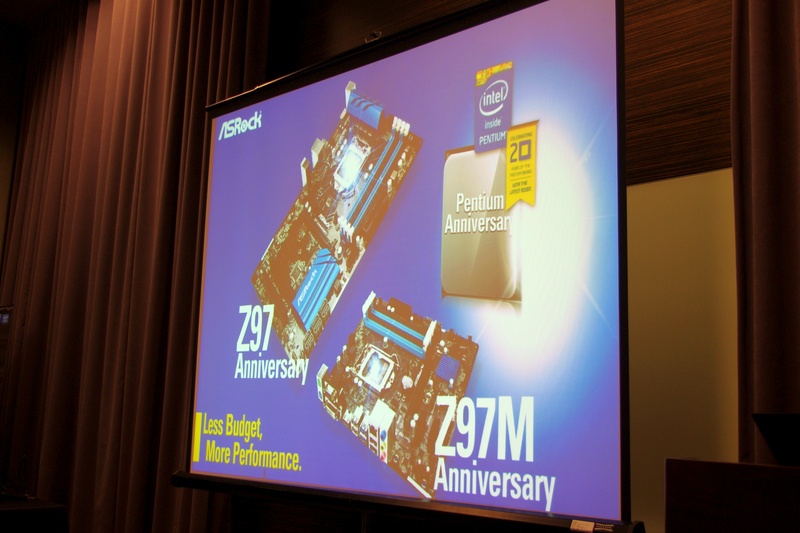 Since the initial announcement from Intel regarding the release of its newest low-cost overclocking processor since Clarkdale (2009/2010), a variety of names have been suggested. 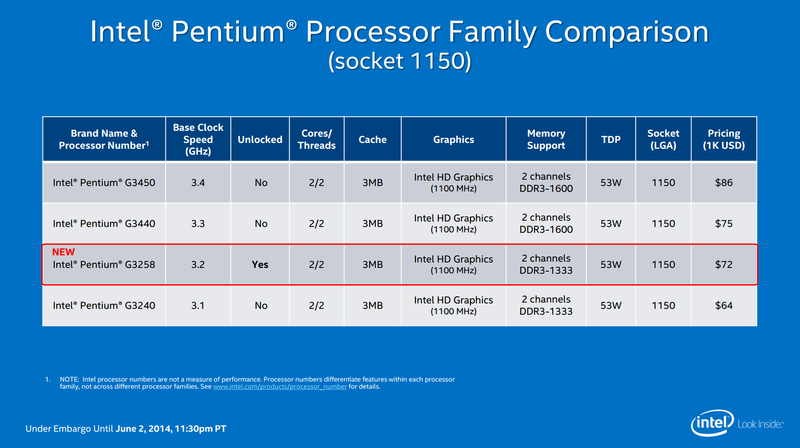 Here at AnandTech, I hypothesized that Intel would continue the K naming scheme for overclocking processors, and call this new part the Pentium G3420-K, or Pentium-K for short. 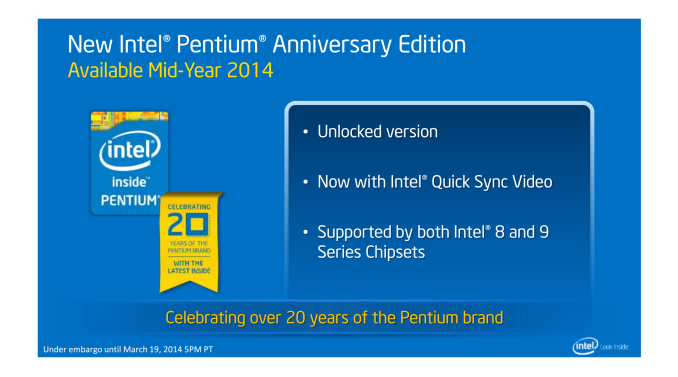 However, to tie in with the Anniversary Edition theme, I have since heard from two separate Intel employees at industry events call the model ‘Pentium-AE’ for short, or the ‘Pentium G3258’ as the official name. In order to remain consistent with the naming, we will use the Pentium-AE or Pentium G3258; however other sources may use other monikers. The Pentium G3258 falls on the lower end of the Pentium bracket. The frequency is high, at 3.2 GHz and matching the G3420, but it comes with only DDR3-1333 support (signified by the G32xx rather than G34xx naming). While this usually does not matter much for overclockers who will likely overclock the memory as well, it does have an effect due to the binning process. Enthusiasts already know that CPUs with DDR3-1600 support can use memory kits above 2666 MHz, but the use of DDR3-1333 on the Pentium-AE CPU may be limiting. It should, theoretically, mean that Intel has a lot more CPUs from the production line that fit into this category. The aim of Pentium-AE can be considered two fold. 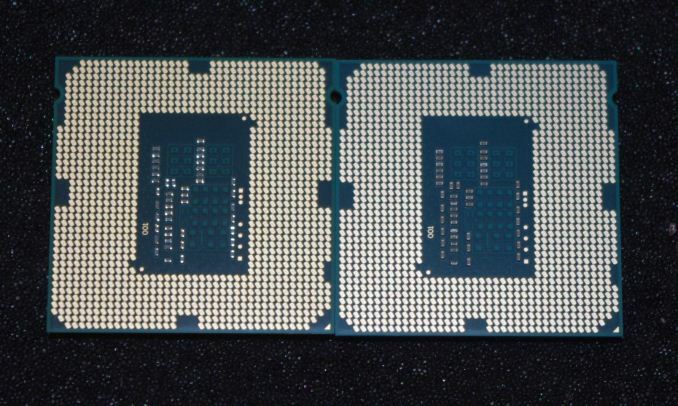 As part of the overclocking community, the ‘cheap and cheerful’ mentality is what got a lot of us started in the first place – can we get top end CPU performance without paying top-end prices? With the CPUs being cheap, they could almost be considered disposable, allowing even ‘casual extreme overclockers’ (as much as that phrasing sounds weird) to try lots of processors and compete in a fun category. The second part of the equation is aimed at gaming. One of the big reasons for growth in the PC industry of late is down to gaming, and the popularity of titles such as League of Legends or DOTA2, among others. These titles typically do not need the latest and greatest, and with the presence of pre-overclocked gaming systems from system integrators based on the Pentium-AE processor, parents who buy systems for their enthusiastic children might be able to start at these lower price points. The added benefit here is that Intel may end up encouraging these individuals to invest in a higher performance machine as they age and can afford it themselves. There have been several concerns since the original Pentium-AE announcement however. Aside from the low core count which may restrict frame rates, the low amount of L3 cache and lower-speed DRAM memory support have both been noted as potential bottlenecks. A number of overclockers have since requested an unlocked i3 processor from Intel, perhaps fleshing out the range of ‘K’ processors which are currently limited to i5 and i7. Other users are also requesting AES-NI and AVX support (which would come with an unlocked i3 processor), as the Pentium range does not have support for these technologies used for CPU throughput or encryption. From the CPU-Z screenshots, the only difference between the G3258 and the G3420 is the name string in the CPU firmware (memory support is not shown here), and moving up to the i3-4330, the AVX/AES support is listed along with hyperthreading. When Intel decided to release the Pentium-AE processor, they had two choices. Either adjust processors coming off the line and turn overclocking ‘on’, or actually make physical changes similar to Devil’s Canyon. If the physical changes were an all-or-nothing policy, then I would have to say that the ‘new’ Pentium-AE is just the ‘old’ CPU with a firmware switch enabled. However, the overclocking performance surprised me a little. The holy grail for Pentium-AE, as the processor was being announced, was to match the history of popular processors such as the Celeron 300A which gave a +50% overclock, or the Core 2 Duo E2160 which could go 100%+ in the right hands. Reaching anywhere near these percentages would be an impressive feat, given that or the past three generations of Intel processors, users have been achieving only +200 MHz (+5%) to +700 MHz (+25%), depending on how lucky they are with the silicon they purchased. Haswell is still known for having a wide swing in overclocking potential from CPU to CPU, so this is still a potential issue with the Pentium-AE processor. Aside from the awkward/inaccurate scaling on the slide shown, the 4.5 GHz number gives a +1.3 GHz over the base frequency, or ~40% increase in clock speed. For our testing we started at 3.5 GHz and 0.900 volts and continued our normal overclocking procedure. If the setting is stable (POV-Ray benchmark and 5 minutes OCCT CPU load), the multiplier is increased, but if for any reason the system fails, the voltage is adjusted by +0.025V offset. This continues until the load temperature is too high, or the voltage jump is overly significant. Moving from 3.5 GHz to 4.4 GHz was very easy. For most jumps of +100 MHz, only +0.025 volts was needed. Above 4.5 GHz, the load temperature started to rise more significantly, as well as the system power. At 4.7 GHz, moving to 4.8 GHz was almost impossible – even with +0.150 volts in the CPU, the system would crash at any loading attempt. This behavior is similar to what we saw with the original Haswell CPUs and also with Devil’s Canyon. As long as the user is not thermally limited, there seems to be a big bump where the amount of voltage needed to increase the frequency by 100 MHz is significantly higher than before. Note we are discussing air/water cooling, rather than sub-zero, which affords different properties. The 4.7 GHz value is also eerily similar to that which we achieved with both the i5 and the i7 Devil’s Canyon CPUs. Note that the peak load temperatures at 4.7 GHz were ‘only’ 76C, but this is for two cores, whereas we saw 79C on the i5 for four cores. 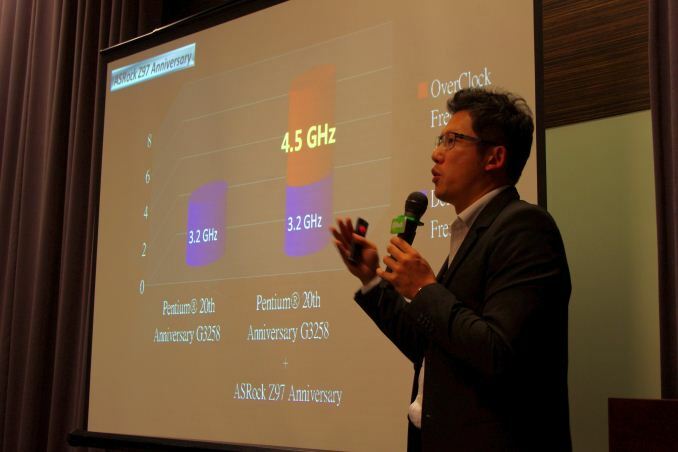 The system power draw, increasing from stock to 4.7 GHz, gave +38W / 41% rise for a ~47% increase in frequency. The POV-Ray performance was also similar, with a 47.67% increase in performance for a 47% increase in frequency/41% increase in power. It can be hard to pinpoint where the typical Pentium user might lie. If we consider a household machine for family use, it is not going to be overclocked. Similarly for simple office use, either for regular Office software or remote connecting, overclocking is not going to be a feature. Overclocking lies at the heart of both the enthusiast and the gamer, which is where we should look first. One could argue that there are HTPC usage points for an overclockable Pentium; however the increase in power draw and temperature for an overclocked processor might not be appropriate. For our testing, our main comparison point at stock would be the Pentium G3420. This Haswell processor’s only difference is the DDR3-1600 memory support, meaning that we test the G3420 at DDR3-1600 and the G3258 at DDR3-1333. 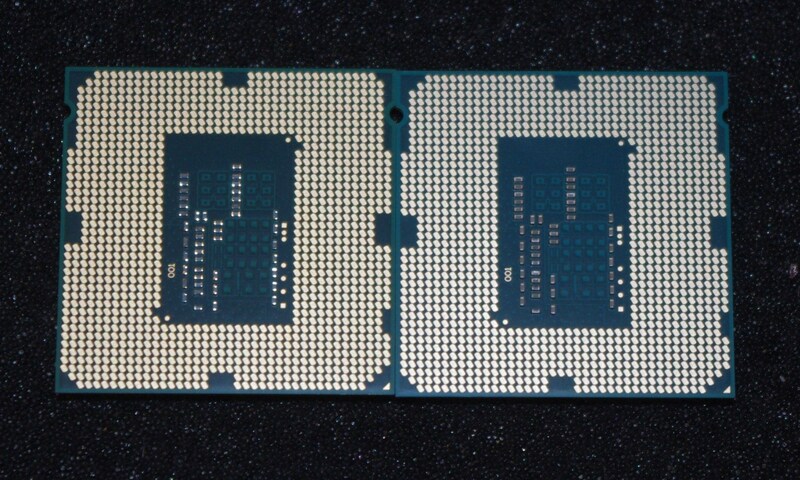 We also compared the overclocked Pentium G3258 with an i3-4330, showing the effect of hyperthreading. For pure CPU performance, the biggest defects from not having DDR3-1600 support are in Photoscan, a 2D to 3D modeling conversion tool. The 47% increase in frequency to 4.7 GHz gives more of a boost, ranging anywhere from 12% in our WinRAR test to 47% in anything that was fully multithreaded with no memory limitations (3DPM, POV-Ray), for a 32% average. 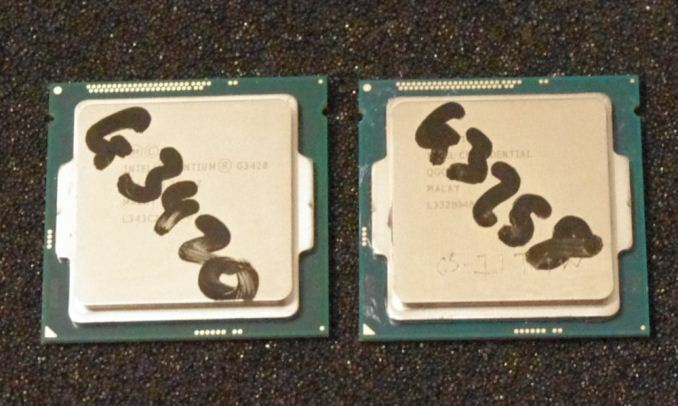 The situation between the i3-4330 and the overclocked G3258 is a story of two tales. While the average score gives +19% to the i3, any single threaded benchmark (3DPM-ST, FastStone) gave an advantage to the G3258 OC while most of the multi-threaded benchmarks looked at the i3. There are clear exceptions to this – video conversion and POV-Ray. For the video conversion tests, especially with the smaller frame sizes of the low quality videos, the benefits of the high single thread speed outweighed the benefits of more threads. It should also be worth pointing out the encryption boost of 339% in favor of the i3 – this is due to AES-NI support on the i3. Without this result in the mix, the average result is actually in favor of the G3258 at 4.7 GHz by 2%. Turning to gaming, and we tested in single and dual GTX 770 formats with six games at 1080p and all the settings turned up. Comparing the G3420 to the G3258 at stock speeds, the effect of DDR3-1600 vs. DDR3-1333 is felt most in Sleeping Dogs with one GPU and F1 2013 in dual GPU mode, giving +7% to the G3420. When the G3258 is overclocked, most of the benefits are given in multi-GPU modes. Here, three of our titles recorded ~30% frame rate increases, with another two around 15%. The biggest beneficiaries of an overclocked Pentium-AE are going to be in the multi-GPU bracket. However, the crux of the situation shows that even with an overclocked Pentium, an i3-4330 can get a lot more out of your graphics cards. In single GPU, we see a 30% increase in frame rates for F1 2013, moving towards 120 FPS. In dual GPU modes, BF4 was the biggest beneficiary with a +42% increase. Moving from 65.7 FPS to 93.4 FPS for dual GTX-770s is a no brainer. Overall, the main performance benefit from having an overclocked Pentium is going to be from all the ‘need-now’ types of CPU tasks that rely on response time. 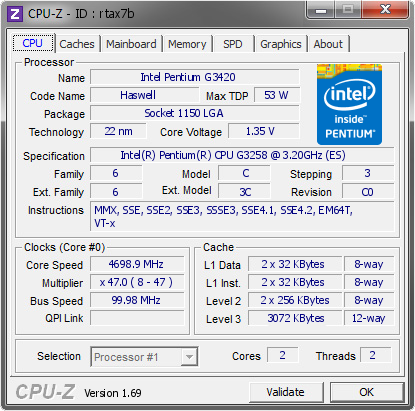 Having a 4.7 GHz Pentium feels fast when opening tabs or documents, but the minute any serious load is applied, the overclocked Pentium will feel ‘on average’ like an i3 at stock. The only exception is AES-NI or AVX workloads that will fly on the i3. Putting this into perspective, this lands the overclockable Pentium at the feet of ‘a bit of fun’, rather than anything serious. Overclocking is a targeted market for motherboard manufacturers; especially those that invest time and money into research to let their users get better overclocking performance. They cannot expect users to purchase a $70 CPU then a $250-$400 motherboard. There will be overclocking enthusiasts that will do that, but the larger market of end-users who want some free performance will most likely be purchasing a motherboard similar in price to the CPU, or perhaps reaching into the $110-$120 range at most. MSI sent me its Z97 Guard Pro while I was testing the G3258, their main motherboard for Pentium-AE. ASUS call upon its Z97-A, and GIGABYTE has the UD3H and lower models as well. So how far do you get on the stock fan? It's good for 95w and this chip is 53w with gpu on, so disabling it using the stock HSF gets you how far? A stock fan built for i7's should get a reasonable overclock with no extra cost (not 4.7ghz obviously). Since this is truly aimed at the poor (who else? people wanting to far around with ocing? ), they'll likely be trying it with stock. Single GPU data is on the first page when you scroll down. We have data for those four CPUs.